The branch websites platform is still very, very new. 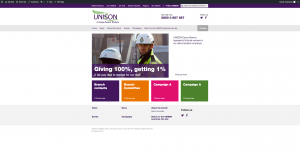 Initial development has focused on taking the main UNISON website platform and slimming it down to make it simpler and easier for branches to use. To test what we’ve built so far, on 30 March we invited 12 activists (from 9 branches around the country) to come to London for our inaugural branch websites ‘hackday’. This wasn’t a full-on Silicon Valley style hack-fest fuelled by pizza and beer – although the activists did get a nice lunch in the canteen. 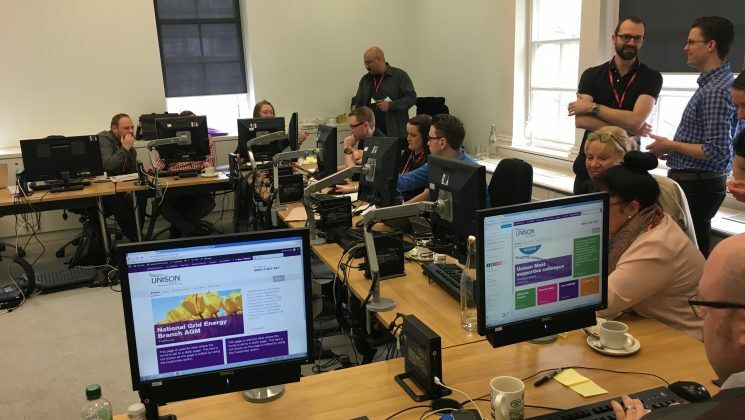 But we did want to get everyone together in one room for one day to test the new branch websites system ‘live’, combining ‘learning’ with ‘doing’. We wanted to talk the activists through what they need to consider when building a site, assess how easy they found it to build a site on our platform (their answer: it’s pretty easy) and have them leave at the end of the day with a site that was close to launch. We also hoped to learn a lot about what we need to fix, improve on and change about our system before we go out to more branches. 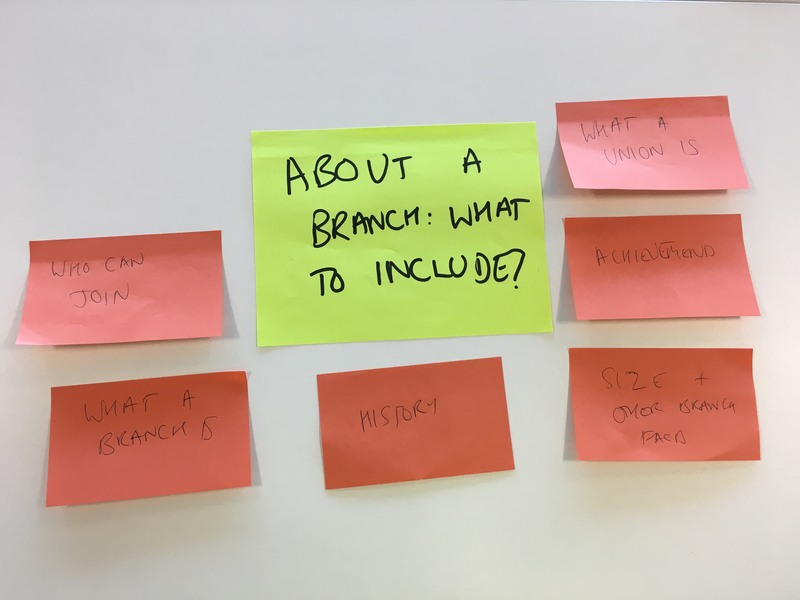 We asked our developers from tech agency HumanMade to come too – not just to help the branches but also to make sure that everyone on the project understood what branches need and why. 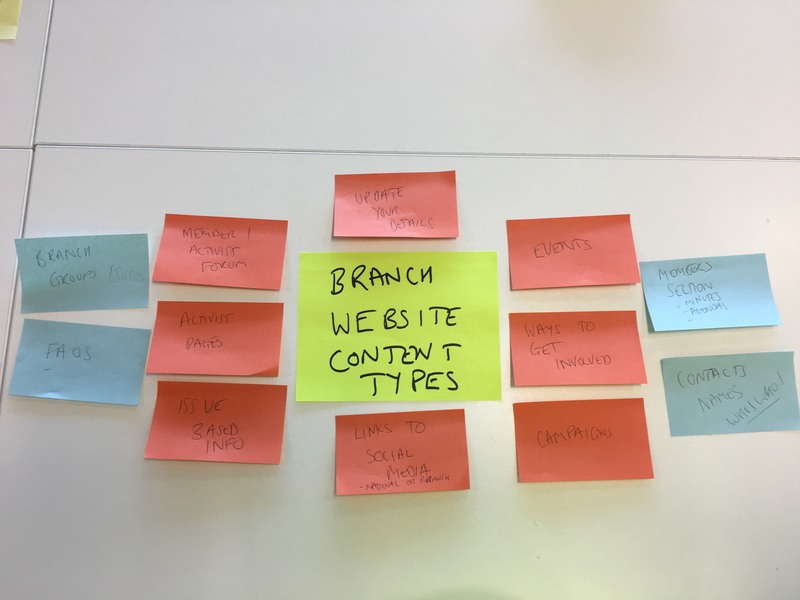 The activists spent the day planning what content would go on their sites and how it would be structured, adding pages and articles to their sites, and planning and building their homepages, with presentations on some elements of basic usability in between. A sneak peak at one option for a homepage for one of our branch websites. 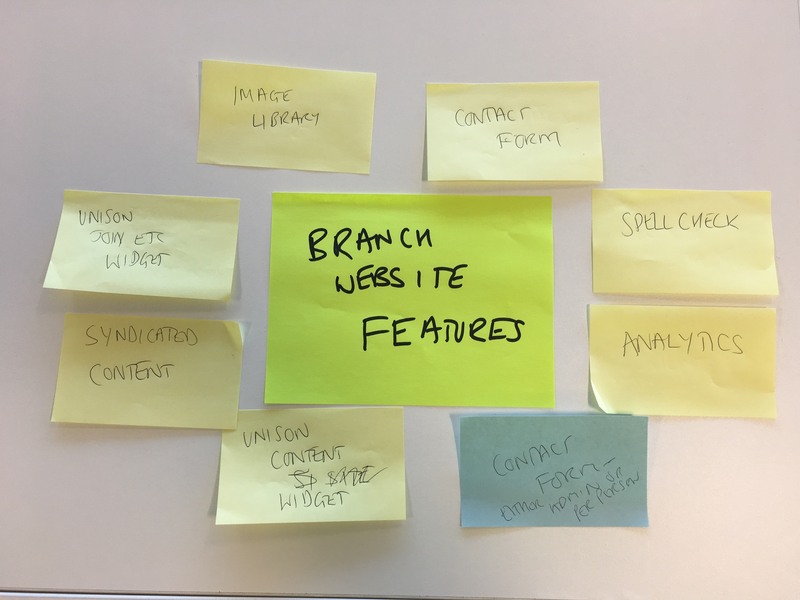 There was a mix of abilities in the group, with some people openly admitting a fear of all thing tech, whilst others were practically WordPress ninjas, but we structured the day so we could let the WordPress ninjas get on with it whilst we gave extra support to those who needed it. What did we learn from our first hackday? We’re aiming to keep in touch with the activists who attended the day to help and motivate them to add the finishing touches to their sites and get them up and running. We are also providing advice on what to do with existing websites and contracts. It’s really important to give people time to play around with the system themselves. 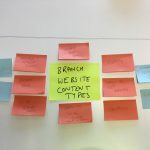 We should have given people more time to plan what would go on their homepage – and when we have more branch websites show a range of different options to help spark ideas. We need to quickly dever online help centre, before next time, for those who are struggling to keep up with live demos of the site. Getting a fully built site for a day is probably too ambitious. However a number of people who participated in the day got pretty close – we hope to see the first few sites live on the new platform in the coming weeks! Finally, we have put through a large number of changes to the platform based on the feedback of people on the day – and just watching where activists were getting stuck or confused. We hope the WordPress sites will offer a cheaper digital solution compared to what many branches currently have and offer members a smoother journey through our different sites. 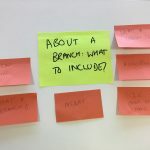 When we launch (planned for June) we plan to offer HackDays through the regions for branch activists to come along and learn how to build their sites. Those who want to can then get their site online and manage it themselves, but we’ll also hoping to offer more a more managed service for those who lack the resources and time to manage a site themselves. We’ll arrange hosting for all the sites. We’re currently working out pricing but we are sure it will be much cheaper than going to external developers, and there’ll be a lot more features too. You can express your interest by entering your branch name and email on www.unison.site – the domain for our branch websites. I’m very happy to see this hackday. 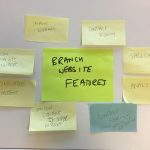 My branch website uses WordPress and I find it very user-friendly, however there are so many plugins and features I think it can look a big overwhelming. The only thing I would recommend is avoiding the fancy templates that WordPress offer, and sticking to a simple template (like the default, or Attorney) – they are much more readable and less likely to go wrong if you decide to add extra widgets or edit the code at a later date. Well done to everyone who got involved. Don’t worry it’ll be a UNISON specific template. The idea is that we provide everything, including approved plugins etc. This isn’t going to be as flexible as completely going it alone with a wordpress install of your own – but it should meet the needs of most branches, we hope! Really enjoyed the day and just want to say thanks again to the team behind it! 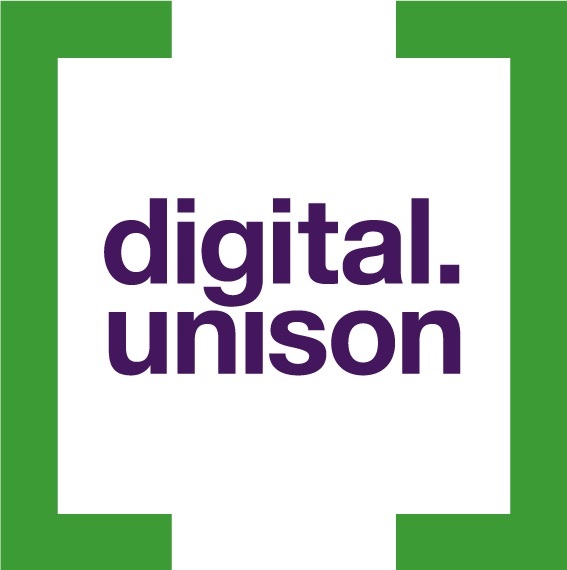 It’s going to be great for our branch to move onto this platform and more importantly our members and the wider UNISON community.